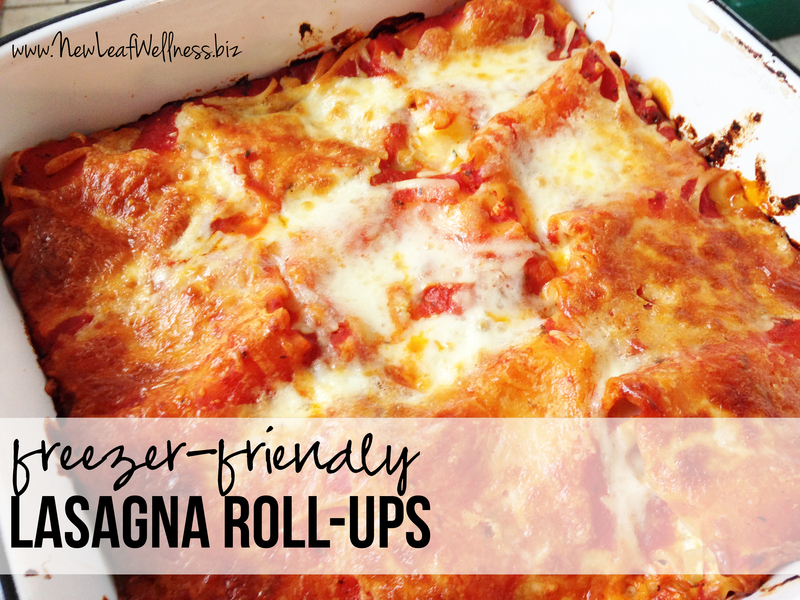 This lasagna roll-up recipe is one of my favorite meals to freeze. 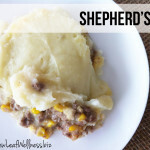 It’s the perfect meal to have on-hand for weeknight dinners and holidays, and I already froze a pan to enjoy after my new baby is born this year. 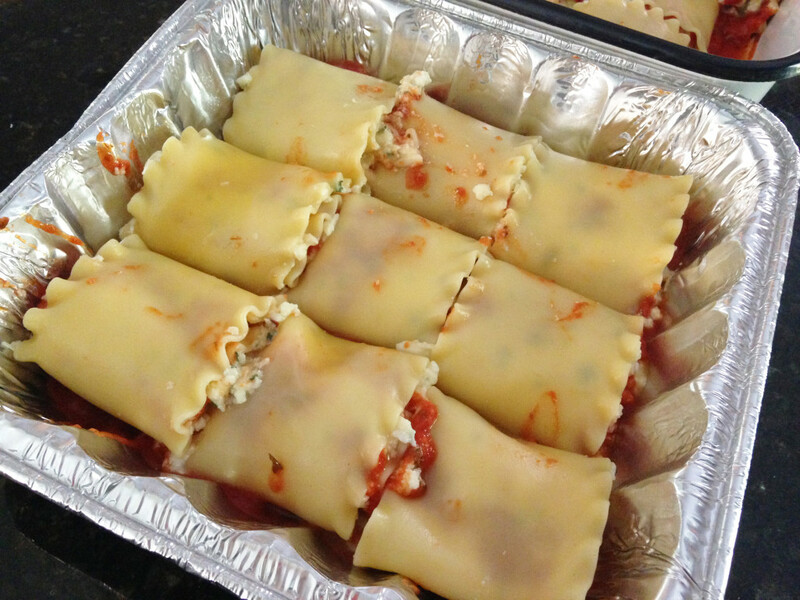 These lasagna roll-ups have a traditional lasagna taste that everyone will enjoy. Even my two year old gobbles them up. 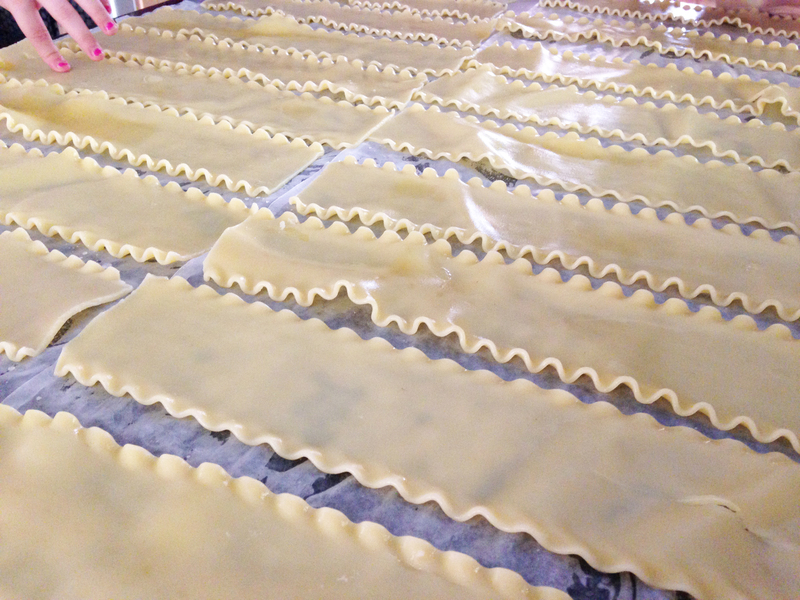 I make regular lasagna with layered noodles too, I like these roll-ups because they come out of the pan so neatly. Each lasagna roll is the perfect serving size. 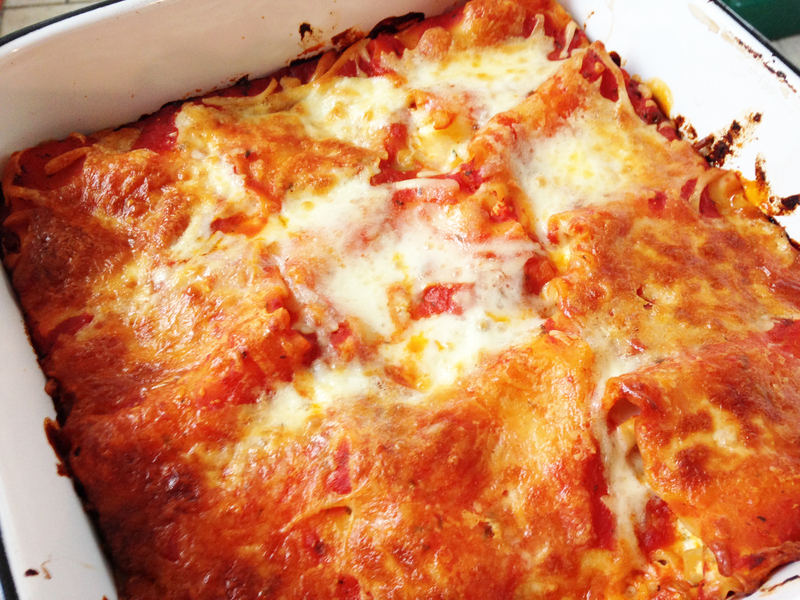 This recipe yields one 9×9″ pan of nine lasagna roll-ups. 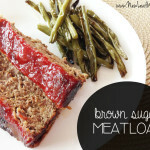 I find it’s plenty for my family of four to eat for dinner – plus leftovers for lunch the next day. 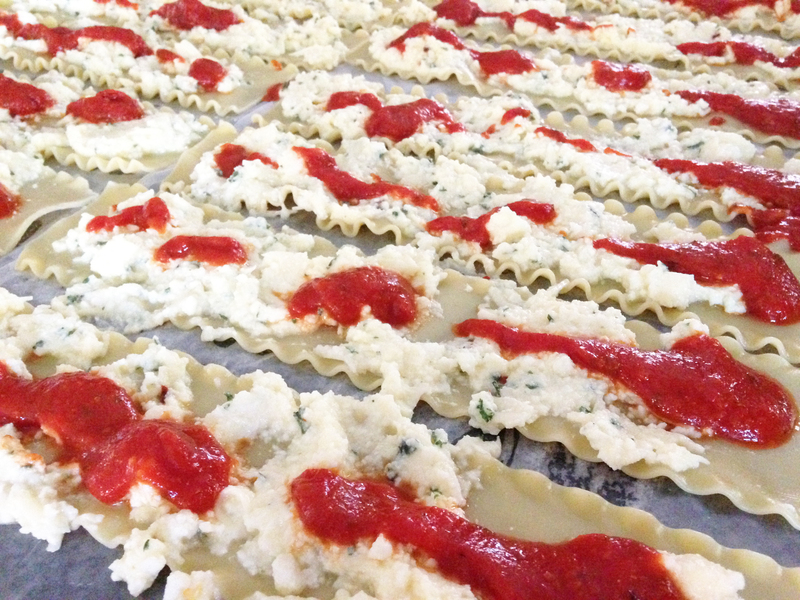 Whenever I make this lasagna roll-up recipe, I double it. I make one pan for dinner and freeze the second one for another night when I don’t have the time or energy to cook. It takes a little bit of time to cook the noodles and prep the cheese, so it’s worth making two pans at a time. Shredding your own cheese tastes a million times better than store-bought shredded cheese and really doesn’t take that much extra time to prep. (Plus if you have leftover parmesan cheese, you can use it to make my homemade pesto!) I use store-bought sauce in this recipe, so consider that your shortcut. 2. Prepare 9×9″ casserole dish by spreading 1/2 cup of sauce on the bottom of it. 3. In a large pan on your stovetop, cook lasagna noodles according to directions on box (until the noodles are uniform in color). 4. While noodles are cooking, create cheese spread in a medium-sized bowl by combining eggs, ricotta cheese, parmesan cheese, half of the mozzarella cheese, parsley flakes, salt, and pepper. 6. Top each noodle with 1/4 cup cheese spread and 1 rounded tablespoon of sauce. 8. Top roll-ups with remaining sauce and mozzarella cheese. 9. Cover with foil and bake in preheated oven for 35 minutes. Remove foil and bake for another 15 minutes, or until cheese is melted and sauce is hot and bubbly. 10. Let stand for 5 minutes to set. Then, slice your roll-ups and serve! Prepare 9×9″ casserole dish by spreading 1/2 cup of sauce on the bottom of it. In a large pan on your stovetop, cook lasagna noodles according to directions on box (until the noodles are uniform in color). While noodles are cooking, create cheese spread in a medium-sized bowl by combining eggs, ricotta cheese, parmesan cheese, half of the mozzarella cheese, parsley flakes, salt, and pepper. After noodles are finished cooking, strain them and arrange them on wax paper in assembly line. You’ll need to do this quickly before the noodles stick together. Top each noodle with 1/4 cup cheese spread and 1 rounded tablespoon of sauce. Top roll-ups with remaining sauce and mozzarella cheese. Cover with foil and bake in preheated oven for 35 minutes. 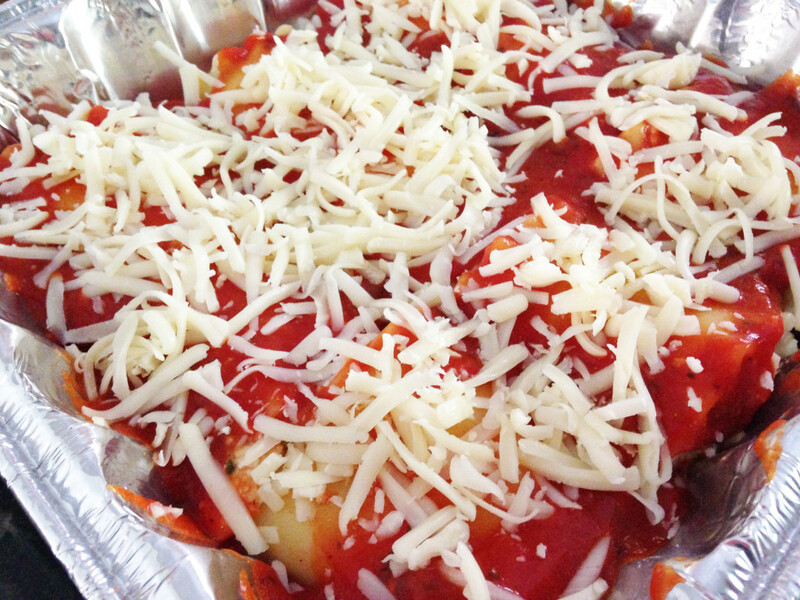 Remove foil and bake for another 15 minutes, or until cheese is melted and sauce is hot and bubbly. Complete Steps 1-8, cool to room temperature, cover with layers of plastic wrap and foil, and freeze. (Lasagna roll-ups can be stored in a standard freezer for up to 3 months.) To reheat, cook in a 350 degree F oven for 2 hours or until hot and bubbly. (You can cut down on the cooking time by thawing overnight in your refrigerator.) 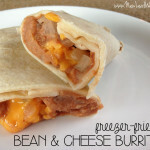 For more detailed info about freezer cooking, check out my best freezer meal tips for beginners. Do you have a favorite recipe that freezes well? Please share in a comment below! Rolling up the noodles THAT way, genius! Why didn’t I ever think of that!!! They’re great! Give it a try! Is the ingredient list for one or two pans of roll ups? 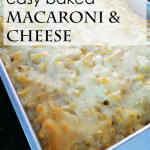 I made these tonight – doubled the recipe and it was enough to make a pan for tonight and two 8×8 pans to freeze! My husband and I both loved it. Served with a salad and nice french bread, one roll up was enough so we have lots of leftovers. I added meat to the sauce since that’s how we like it and it was delicious. Thanks so much for sharing your awesome recipes! YUM. Great ideas, Chris! Thanks so much for letting me know. Could you add spinach to the roll-ups? My husband loves spinach in his lasagna.